Alex's Motorcycle Adventure Alaska, Mexico, Central + South America! Modern Motorcycle Diaries: Panama to Colombia - Motorcycle transport, Captain Chacon, Fritz the Cat, moto accident and 23 stitches later, and the most Random Encounter in all the World! Panama to Colombia - Motorcycle transport, Captain Chacon, Fritz the Cat, moto accident and 23 stitches later, and the most Random Encounter in all the World! First off my apologies on the time it took for these next posts coming up. Been very busy as you’ll soon find out. So after our nice visit to the end of the Pan America highway in Yarviza and the adventure that was in itself we headed back to Panama City where we spent 2 days. I continue to love my shopping basket from Nicaragua, best idea ever! We then headed to Portobello to catch a voyage from Panama to Colombia by boat with motorcycles on Fritz the Cat, a catamaran we hope will help not move too much with the sea sickness thing. When we arrived in Portobello, famous for what Pirates of the Caribbean shows us in movies, it was raining pretty bad. We also ran into some Costa Rican’s on a KTM that were also on the boat. Gabriel the driver was nice enough to give me some grease to put on our chains and sensitive areas of the bike to prevent rusting. My suggestion for the fellow riders is that everything will rust on a sea voyage, but it’s no big deal except for the electrical stuff that you play a game of chance with whether or not it will be severely damaged. My last voyage I did nothing and things rusted, but had no issues after I starting riding and the rust basically worked itself out. Same with this voyage. Saw the last of the cool Panama buses. Getting the bikes on the Catamaran was a job only for the crazy and those with nerves of steel! Oh boy here we go again! I was a veteran on unloading and loading motorcycles onto and off ships, so I took control of the situation with directing people on what to do and where to go, assuring the other riders not to worry that I would take care of their precious cargo. Captain Chacon at your service! The other bikers from Alaska were scared out of their mind after a slip up on the board connecting the dock and the boat when they over accelerated the bike and made it slip, that’s when I stepped in translating for everyone and I loaded every bike after they saw how efficient and safely I did it. After some nice stress and huge responsibility and relief I did some surfing to celebrate my success of getting 6 bike on board coordinating the massive language barrier and chaos. 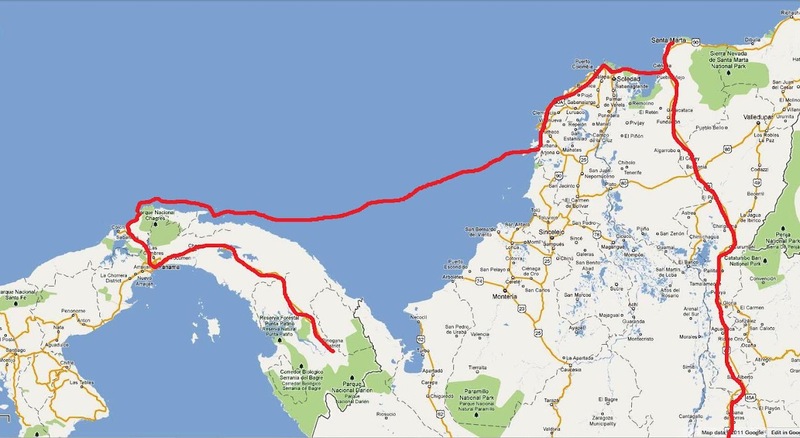 I drove my motorcycle over the ocean to Colombia, call the Guinness World book of Records! its a first! Next time I’ll be sure to charge for my services. But I just wanted to get on the ocean as fast as possible. So to make our 5 days voyage from Panama to Colombia short I’ll just put up pictures and say a few things. The first two days are great at the islands, but the last 3 days you’re on the open sea and most everyone was sea sick. My last trip I was sick all 5 days including being sick from food poisoning and it was one of the most extreme and suffering experiences of my life. I will say I love Scopolamine! Which is a sea sickness medication, it worked and I didn’t get sick. And my voyage as awesome! I was able to enjoy the sea and sailing instead of lying down the whole time or over the edge of the boat puking. Much better than my last experience which you can read about if you click here! I was also Super Medic again on this voyage, Fritz went fishing and caught a Poisonous LionFish, which on the way back stung his hand. So Chacon the medic stepped in, put his hand in hot water to denature the proteins that the poison carries to create pain and swelling to prevent their spread an causing more damage. Cleaned, disinfected, and gave him some medication to relax. I need to start getting paid for these things, I’d be rich! I would definitely recommend taking a Catamaran, and Fritz the Cat, it’s much more stable than anything I’ve ever been on and made my sea sickness almost nonexistent along with the medication. Fritz had plenty of food, water and fruit at all times. Last time I was starving for food. Thanks Fritz! Arriving in Cartagena the unloading was a pain and stressful again, regardless back on dry land! I missed my favorte Moto taxi's! And since I was the official professional adventure rider and border and customs guy according to all the other bikers after they heard about everything I’ve done, including this being my second journey, I took the liberty to import everyone’s bikes with customs, all 6 of them! It was an entire day of sitting in line and getting documents and such passing my way through lines my flitering wit hthe nice Colombian ladies to do my paper work first and quicker. What sucked was that the guy who stamped our passports into Colombia messed up on the date of our entry so we had to look for him all over Cartagena to Void our stamp and give us another one, which took most of the day. Just keeps getting better and better right? After our permits were ready and got our mandatory insurance, all the bikers split off their own ways. We headed to the volcano El Totumo, where you can enjoy a nice mud bath. You can even get a massage. And it looks pretty cool when you let the mud dry. We then headed to the national park Tyrona, where we stopped to take off our rain gear and had a 40 minute conversation with the family selling drinks at the speed bump. Well more like we were hassled about our trip and enacted to buy some drinks for 40 minutes. So get ready for the something amazing, remember how 6 months ago I was in the Patagonia, on some random road with a water fall... I didn't think so, you can click here to read about it. But anyway, I met a random Colombian girl going up hill on a bike, in the middle of nowhere! we talked and said our good bye's. I tried contacting her later on but wrote down her information incorrectly and never saw her again. Well at the entrance of Tyrona, guess who I saw? that right the same Colombian girl! this is the craziest encounter I've ever had. Never in my life would I have guessed I would ever see her again. Life is amazing sometimes, the chances of ever seeing her again is greater than the lottery I estimate, it was amazing! We both couldn't believe it! Alright so here goes some fun stuff. A huge disclaimer and warning to those reading this, ahead is some very very graphic content, lots of blood and flesh, if your squeamish, skip this part, you have been warned. So as we passed through Tyrona, the roads were pure mud, and riding was quite difficult. Unfortunately David had a pretty bad crash and seriously cut up his leg, so much in fact we had to visit the local emergency room an hour away back in Santa Marta at the hospital. David had to get 23 stitches, luckily we got there quickly, and I also had my first Aid kit to patch him up nicely until we got there. We were attended very nicely and quickly and David was very thankful. Of course I didn’t mention I had to lie that we couldn’t stop the bleeding and David was anemic and needed help ASAP, so we got attended to immediately. All for a total cost of $60 dollars! And another $50 for medications and antibiotics. Another day another adventure. To Bogota we go! Limping foot and all!